Where Should Your Senior Loved One Live? Anyone who has taken on the task of caring for an aging parent faces a difficult decision: should you have them come to live with you? From time to time a family member may become concerned about a loved ones driving abilities. Although driving ability is not necessarily determined by age and many seniors drive safely and successfully, there are changes which can affect driving ability over time. Many of these changes happen as we age and these can contribute to unsafe driving practices. Some changes can affect the ability to turn the head to check for traffic, or to brake quickly. Other changes affect the ability to respond appropriately to situations as they occur. All drivers must have the ability to react quickly to other cars and people on the road. Some elderly drivers are a danger to themselves and others on the road. Driving is an activity which requires many thought processes, actions and movements all happening simultaneously. It requires quick thinking and quick reactions, which for many people, diminish with age. According to the National Highway Traffic Safety Administration (NHTSA), statistics do show that older drivers are more likely than younger ones to be involved in crashes. Risk of injury or being killed in a motor vehicle accident does increases as people age. In addition, a senior who is involved in a motor vehicle crash is at greater risk of injury or death than someone younger. If you are hesitant about having the discussion about driving with your loved one, considering the possible outcome could help you overcome your hesitation. How do you know when the time has come? There are warning signs to look for if you are concerned about a family members driving or even your own. We have put together a "Senior Driving Checklist" for you to print and fill out. When you notice some of these warning signs it is time to assess the situation. Don't wait for an accident to happen. You can also take a look at the other resources we have listed. First of all, do not assume that one discussion will be all that is needed. This is a delicate situation which may require many conversations. You must be respectful of their right to make choices. Secondly, don’t come on too strong or as a “know it all”, be considerate of their thoughts and feelings, and let them have a say. If your loved one has Alzheimer’s disease or dementia they may be unaware of the changes in their abilities and capabilities. When someone is unaware of the changes, this can result in great reluctance on their part of giving up the ability to drive. They may see this as a great loss of their independence and can be quite traumatic for some people. It is important to consider the person’s feelings. Ask them questions. Lead the conversation with questions to get them talking. This may help them to see the need to give up driving. Ask them “How have you felt recently when driving or after driving?”, “Have you gotten confused at all recently when driving?”, “Can you tell me about the new dents on your vehicle?” It may even be possible for you both to fill out the “Senior Driving Checklist” together. What if they are reluctant to give up driving? Many seniors are reluctant to give up driving because they fear the loss of their independence. In this situation, rather than just taking their keys, a road test would be a good consideration. In some states, the local Department of Motor Vehicles offers testing to determine a person’s abilities when driving and responding to situations when on the road and in traffic. They can also test for vision and distance perception. If your state does not offer this service, there are companies which offer this service. The Alzheimer’s Association or other similar agency may be able to provide a list of resources. Some places offer a Mature Drivers course, if your loved one is reluctant to take the course, remind them that their insurance and their roadside assistance may offer a discount for taking it. What if they refuse to give up driving? If at all possible it is always best to get your loved one to agree to give up driving voluntarily. The loss of the independence can be traumatic and can lead to depression, having that right taken from them can be even more traumatic. Be prepared for this ahead of time. Sometimes however, they simply refuse to do so voluntarily. Then comes to the difficult decision, for their safety and the safety of others, to take drastic measures. Involve their physician: Schedule an appointment with your loved one and their physician so you can discuss the situation together, seniors often will listen to and respect the opinion of their physician. If you do go to talk to the doctor, bring alone a copy of the “Senior Driving Checklist” filled out. Sometimes the loss of driving ability is a process and the doctor may recommend some first steps such as the agreement to not drive after dark. Discuss these options together. Involve their optometrist/ophthalmologist: as stated above, seniors will often respect their opinion. Involve the State Department of Motor Vehicles (DMV): In some states, it might be best to alert the department of motor vehicles. The caregiver can often meet with a representative and request a driving test and vision examination, some states do not honor this request. In some states you can write a letter directly to the DMV and express your concerns, or request that the person’s license be revoked. The letter should state that “(the person’s full name) is a hazard on the road,” and offer the reason (Alzheimer’s disease). The state may require a statement from your physician that certifies the person is no longer able to drive. Research your state or talk to a physician who may be able to guide you. Contact your local DMV to find out their recommendation on how to proceed. Control access to the keys: designate one person to do all the driving and give them exclusive access to the car keys. Disable the car in some way: Discuss this with a mechanic. Give the person a set of keys that looks like his or her old set, but that don’t work to start the car. Consider selling the car: Discuss with your loved one the potential financial savings which comes with selling the car. There could potentially be enough savings to pay for any public transportation or even taxi rides. There would be savings on insurance, vehicle payments, gas, maintenance, etc. If you have increasing concern about your loved one’s driving, the above information should give you some ideas for how to begin the conversation. If you are in our area and need transportation services, feel free to call us to discuss some options for your family. In 2010, pneumonia, combined with influenza, was the eighth leading cause of death in the United Sates, according to the National Center for Health Statistics. On top of this, 1 out of 20 adults who get pneumonia dies, according to the Centers for Disease Control. This makes preventing pneumonia in the elderly a serious matter. "Pneumonia is an inflammation of the lungs usually caused by bacteria, viruses, fungi or other organisms," says Dr. Norman Edelman, the chief medical officer for the American Lung Association. This inflammation causes an outpouring of fluid in the infected part of the lungs, affecting either one or both lungs. The blood flow to the infected portion of the lung (or lungs) decreases, meaning oxygen levels in the bloodstream can decline. "This decline is more likely to happen in an elderly, sick, and/or debilitated 85-year-old. The body attempts to preserve blood flow to vital organs and decrease blood flow to other parts of the body such as the GI tract," says Dr. Joseph Mylotte, a professor of medicine at the School of Medicine and Biomedical Sciences at the University of Buffalo. "The effects [of pneumonia] are widespread even though the infection is localized to the lung." The complications of pneumonia in the elderly can be life-threatening, from low blood pressure and kidney failure to bacteremia, an infection that spreads to the bloodstream. Elderly people are more susceptible to pneumonia for several reasons. Often they already suffer from co-morbid conditions such as heart disease, which means they don't tolerate infection as well as younger people, says Mylotte. Age also causes a decrease in an older person's immune system response, so his defenses are weaker. "Some virulent organisms can cause infection in younger people, but the infections can be worse in older people," says Mylotte. Often, a person may think she is simply suffering from the cold or flu. Also, it is widely believed that the signs of pneumonia in the elderly can differ from the general population. An older patient might not have a fever. "The symptoms and signs are sometimes not as specific. They may be more sleepy and lethargic, or lose their appetites, or they may suffer from dizziness and fall. If there is underlying dementia, they might not be able to tell you how they feel. But it's all related to something going on in the lung," says Mylotte. People are often exposed to the organisms that cause this disease, but the lungs' defense mechanisms usually protect people from infection. Sometimes these organisms break through a person's immune system, infecting the lungs' air sacs. Each lung has a major airway (bronchus) that divides into twenty-two tubes; these tubes further divide into more than one hundred thousand tiny tubes (bronchioles) that end in clusters of tiny air sacs (alveoli), where the transfer of oxygen to the body's bloodstream takes place. When a patient has pneumonia, the affected air sacs become inflamed and filled with fluid. This leads to breathing problems, a lack of blood flow to the infected sections of the lungs, and a decrease in the bloodstream's oxygen level. Simple diagnostic tests can confirm a case of pneumonia in the elderly. A doctor who listens to a patient's lungs may hear bubbling sounds called rales and rattling sounds called rhonchus, which signal infection and inflammation in the lungs. A pulse oximetry test computes the blood's oxygen levels. A chest x-ray or CT scan is often the definitive diagnosis, telling the physician where the infection is and the degree of the illness. Sometimes a doctor will have the patient's phlegm or blood analyzed to decipher which organism is responsible for the infection. Although pneumonia can be caused by more than two dozen organisms, pneumonia in the elderly is usually caused by bacteria or viruses. The streptococcus (or pneumococcal) pneumonia bacteria is responsible for an estimated forty thousand deaths every year, according to the Centers for Disease Control. The elderly are more likely to catch this strain of pneumonia. Streptococcus pneumonia can come on slowly or suddenly. It can damage the lungs, cause bacteremia in the bloodstream, and meningitis in the brain. Viruses also trigger this disease, and are thought to cause about 50 percent of pneumonia infections in the general population. Usually viral pneumonia is less severe, but complications can include bacterial pneumonia. Atypical pneumonia-causing organisms-such as mycoplasma and chlamydia-rarely cause pneumonia in the elderly. In the nursing home population, a small percentage of people suffer from severe pneumonia strains caused by organisms such as Gram-negative bacteria and Staphylococcus aureus, which can quickly end in death or with the patient on a respirator, says Mylotte. Patients are treated for pneumonia depending upon which organism triggered the disease. Your loved one's medical provider can ascertain this through analyzing a phlegm or blood sample. For a case of viral pneumonia, some patients may receive antiviral medications, but these are not commonly prescribed. And antibiotics are not used because they aren't effective against viruses. Bouts of viral pneumonia usually heal without medication, provided the patient rests, eats healthy food, and takes in plenty of fluids. If new symptoms arise, it is important to contact your loved one's doctor, as bacterial pneumonia is a possible complication. Bacterial pneumonia is always treated with antibiotics. If a patient is in the hospital, it is typical for the hospital to follow strict treatment guidelines. These guidelines are part of pay-for-performance programs, meaning the doctor will get paid a better rate if she follows the guidelines, says Mylotte. Both the American Thoracic Society (www.thoracic.org) and the Infectious Diseases Society of America (www.idsociety.org) have standard treatment guidelines available on their respective websites. These are based on where the patient acquired the disease-in the community, in the nursing home, in the hospital-and these guidelines can be found on each organization's website. Whether at home or in the hospital, patients are usually administered a once-a-day therapy. Effective antibiotic treatments include respiratory fluoroquinolones such as moxifloxacin, says Mylotte, although there are several antibiotic therapies that work as well as these. Treating bacterial pneumonia has become more complicated due to antibiotic resistance: The organisms that cause this disease mutate and can become resistant to drug treatment. This is one reason that it is important for a patient to finish her entire course of antibiotics; stopping treatment early actually encourages antibiotic resistance. Up until a few years ago, antibiotic resistance associated with bacterial pneumonia had been increasing, but it has recently decreased, according to Mylotte. Both mycoplasma and chlamydia pneumonias are also treated with antibiotics. Mycoplasma pneumonia is also known as walking pneumonia. If your loved one has this strain, he or she usually will have milder symptoms, but it can take four to six weeks to heal completely. Most pneumonia patients heal at home. About 15 to 20 percent of people with community-acquired pneumonia are treated in the hospital, while about 20 to 30 percent of people withnursing-home acquired pneumonia are also admitted to a hospital, according to Mylotte. Whether a patient stays at home or in a hospital, she may take medications to ease fever, aches, and coughing bouts. Because coughing actually helps rid lung infection, this action shouldn't be entirely reduced. However, if the patient isn't getting any sleep, a low-dose cough suppressant can be prescribed. Patients with severe strains may need oxygen therapy to increase blood-oxygen levels. Caregivers should make sure a loved one is receiving proper hydration, eating at least a small amount of healthy food, and reporting worsening or new complications, says the American Lung Association's Edelman. Bacteremia: The possibly deadly infection invades the bloodstream and can infect the body's organs. Pleurisy and Empyema: With pleurisy, the membrane that covers the lungs (pleura) becomes inflamed. Empyema occurs when fluids causing inflammation become infected. Lung Abscess: A pus-filled cavity can develop in the infected lung area. Acute Respiratory Distress Syndrome (ARDS): When the lungs become severely injured due to pneumonia, respiratory failure can occur. Treatment includes the use of a mechanical ventilator (vent) and supplemental oxygen. Pneumococcal Vaccine: This vaccine helps prevent twenty-three different strains of bacterial pneumonia (although there are many more strains of bacterial pneumonia out there). "It doesn't always engender a good immune response in adults, so it doesn't always work well," says Mylotte. He also points out the vaccine is effective for a shorter amount of time in older people. Experts recommend getting your first dose when you are in your 50s and your second dose at age 65, and then a new dose should be administered every five years. Influenza Vaccine: This vaccine is just as important as the pneumococcal vaccine. It doesn't work as well in elderly people, says Mylotte, but if an older vaccinated person gets the flu, it is usually a milder case. Pneumonia is often a secondary infection after an initial bout of influenza; people who receive this vaccine have less risk of developing pneumonia as a flu complication. 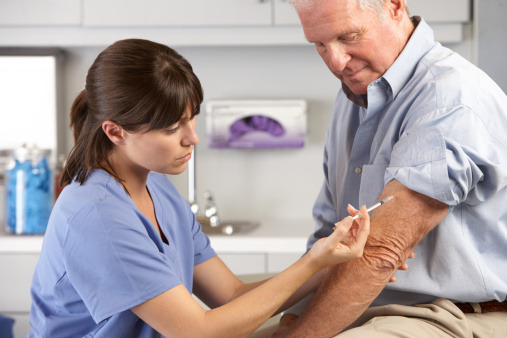 Older adults should get a flu shot every year. Hand Washing: "I always tell people to wash their hands as much as they can. If your hands aren't raw in the wintertime, you are not doing a good job," says Mylotte. Dental Hygiene: Pneumonia infections can occur around infected teeth, says Edelman, so dental work should be kept in good repair. Good Health Habits: Exercise, rest and healthy eating can all increase resistance to pneumonia. Edelman also recommends that frail elderly people who are already susceptible to infection should stay away from anyone who has the flu or a bad cold. Of course, preventing pneumonia in the elderly is always preferable to treating it. But if you suspect your loved one is suffering from pneumonia, quick intervention can be a life-saving occurrence. As your family members or loved ones age, so does their home. It is good practice to step back occasionally and examine the home to see how well the living arrangement supports your loved ones’ daily needs and activities. There are many steps you can take to ensure that your family members stay safe and comfortable in their home.Often these changes can be made with little or no cost, while they also make the home more user-friendly and welcoming. In this column, I note some safety tips to evaluate in your loved ones’ homes, so you can help them successfully age in place. Remove all scatter and throw rugs, which can lead to falls. Open blinds and curtains, and raise shades during daylight hours to increase natural light inside the home. Place electrical, phone and computer cord, along walls, where they will not trip anyone. To avoid the risk of fire, do not run the wires under carpeting. Remove clutter fromthe staircases and hallways to prevent trips and falls. Set the hot-water heater to 120 degrees to prevent scalding and to reduce energy consumption. While all of the above can be done without spending money, you might find some changes are hard for your loved one to accept. For instance, Mom may like her scatter and throw rugs because they add color to her rooms. It’s important that you explain to her why you are suggesting removing these trip hazards. Tell her you want her to consider the change because you’re worried about her falling and seriously hurting herself. Be creative in how you approach the conversation – perhaps suggest that she could move the rug from the floor to the wall or add throw pillows on a chair or sofa to add color without safety risk. Increase lighting by using the highest-watt bulbs possible for fixtures or lamps. Place double-sided tape or carpet mesh under area rugs to prevent slipping. Install offset hinges on all doors to add 2 inches of width for easier access. Replace traditional light switches with easy-to-use, rocker-style switches. Install night lights in hallways between bedrooms and bathrooms. Replace knobs on cabinets and drawers with easy-to-grip D-shaped handles. Add anti-slip strips in the bathtubs and showers. Mount grab bars in the bathtubs and showers, and place a sturdy water-proof seat in the shower so your loved one can sit down while bathing or showering. Install a handheld adjustable shower head for easier bathing. Install handrails on both sides of each stairway to support your loved ones’ sure footing. You can find low-cost tools and products at your local hardware or home improvement store. It's important that you or a contract or properly install all the updates, so find a reputable handyman to help you if you need assistance. It might be hard for your loved one to consider certain features, such as the installation of grab bars in the bathroom. “I don’t want those things,” Mom might say. “It’ll look like a hospital room.” This is the time to speak from your heart. Use “I” statements. Tell her you worry about her and you want her to be safe in her home. Add that grab bars come in a range of colors and finishes that can match the decorating scheme of any bathroom. Tell her the days of “institutional-looking grab bars” are long gone. Go with her to the store to look at what’s now on the market. In addition to the changes listed above, always remember to have a properly rated fire extinguisher in the kitchen area, and fire and carbon monoxide detectors on all floors of each house. AARP recently developed a video, “There’s No Place Like Home.” (Watch: Part One, Part Two.) It documents how easy and affordable it can be to update kitchens and bathrooms to dramatically improve home safety. You can show the videos to your parents to help them understand that they can easily improve their safety and your peace of mind. Since your loved ones likely want to live at home as long as possible, consider more extensive changes to the home so that it will be sure to meet loved ones’ daily living needs. Design features such as multi-level countertops and pull-out drawers in the kitchen provide easy access to pots and pans. No-step entries to the home may cost more, but they can make homes safer and more comfortable for everyone. AARP and the National Association of Home Builders (NAHB) have collaborated to help develop a certification program for remodelers, builders, and developers who focus on the connections between home design and the needs of aging people. The Certified Aging-in-Place Specialist (CAPS) program teaches building professionals about the changing needs of people as they age, as well as products and building techniques that can better support aging in place. While there are more than 1,700 certified professionals in the U.S., there is only one in Oklahoma. Realtors, interior designers, and architects have discovered that consumers are starting to show more interest in features and products that promote successful aging in place. People are also realizing that when homes are designed and constructed with these features, the homes’ value increases. Proponents contend that these homes are “easy to build, easy to visit, and easy to sell.” Across the country, builders, developers, and realtors are replicating elements of “universal design” – design informed by features that provide comfort, safety, and the ability to age in place. There is significant consumer interest in aging in place and the type of home required for it. No home can be “sweet” if it isn’t “safe.” The types of home features and fix-its described in this column make homes easier to use, which increases the independence of residents and makes caregiving easier. I hope that these ideas prompt you to evaluate your loved ones’ home and to make the kinds of changes that you deem necessary and beneficial. Elinor Ginzler is a national expert on independent living and aging issues. She currently serves as AARP’s lead spokesperson on caregiving, housing, and mobility issues, including older drivers’ safety. Connecting with others is at the core of being human - and it's something that doesn't change when a person has dementia. We're often asked what are good activities for dementia patients. It's important to know that there are many ways you can continue to form connections and strengthen bonds with your loved one during this time. Fill the bag with items reminiscent of their late teens/early twenties. Scented products work well for this, as scents are strongly tied to memory. Try including soap, perfumes and aftershave, or holiday scents like gingerbread, pine and peppermint. Photo albums with pictures from their childhood or young adulthood are best for this. Old periodicals are another good option, particularly those that include many photos such as Life or Time magazines. If your loved one has a favorite book, read it out loud to them and let them hold the book and feel the pages. Encourage them to enjoy the distinctive "old book smell." Reading aloud works especially well with poetry, as the cadence of the words are familiar and calming. Download songs or set up radio to stream that features music from their teenage years. Many internet radio stations include everything from classic rock to big band sounds, their favorite music should be easy to find. If they grew up going to church, sing old hymns with them. If it's around the holidays, sing holiday carols or other special songs. Class sing-a-longs and music classes were much more common in schools prior to the electronic age. You might be surprised at what songs your loved ones know and remember from elementary school. Did your parents grow up watching westerns like Gunsmoke or family dramas such as My Three Sons? Perhaps they were more interested in musicals like "The King and I" or "Singing in the Rain." You can find many favorite movies and shows from the 40s, 50s and 60s on Netflix or other streaming services. Use nature to integrate sensory experiences into conversation. Listen to birdsong, touch the wet grass, smell the roses and feel the sunshine on your shoulders. Ask what their favorite outdoor activities were during their youth and try to safely recreate similar scenarios if possible. In the past, women spent a great deal of their teenage years learning to cook and young adult years cooking for their families. Discuss origins and variations on old family recipes, or better yet, cook with those old family recipes and share the results with your loved ones. Look for candy or other indulgences that were commonplace when your loved one was young. Many companies specialize in nostalgic candy where you can buy old favorites like horehound candy and soft peppermint sticks. Even simple things, like an orange, can be a treat to someone who remembers when you only had them during holidays. People who grew up on farms may enjoy an outing to a petting zoo or family farm where they can touch and talk to horses and other farm animals. Ask questions about animals, old pets, or what it was like to grow up on a farm. This is a great activity to involve grandchildren in, since many kids today are not familiar with farms. Nothing elicits childhood memories like familiar old toys. Erector sets, kewpie dolls, sock monkeys and marbles were some of the most popular toys during the 40s and 50s. There are many websites dedicated to antique toys. If you have any old toys available, bring them when you visit, ask questions about how they were played with, or, in the case of construction toys, build something together. Did your loved one quilt, crochet or knit? Put a homemade quilt or skein of yarn in their hands and let them feel the weight of the quilt and the scratchiness of the yarn. You may be surprised to find that your loved one can still crochet or knit a little bit, even though they have serious memory or cognitive deficits. Often, the muscles remember what the brain has forgotten. Your loved one may be different than the person you have always known, but they still long for connection and companionship. You can encourage that connection by using these activities to enrich both of your lives. Retirement can trigger a complex range of emotions, including fear and depression. For some people, retirement planning conjures up images of languid days free from the demands of the daily grind, but for others the prospect of leaving the workforce may be a daunting or even frightening transition. For most, this major milestone will elicit a mixture of emotions that fall somewhere between anticipation and apprehension. Retirement is, in fact, a complex experience for almost everyone, characterized by gains and losses and tremendous shifts in identity and routines. "Unless those challenges are addressed and dealt with, the so-called 'golden years' can be tarnished," says Irene Deitch, PhD, psychologist and professor emeritus at the College of Staten Island, City University of New York. "Even those who may have thought they were prepared can find that the transition is tougher once they're actually in the throes of it." Understanding the common hurdles of retirement — and how to overcome them — can be essential to making your retirement happy, fulfilling, and truly one of the best times of your life. Who am I? "We often identify ourselves by what we do — 'I am a professor,' 'I am a painter,' 'I work on an assembly line,' or what have you," says Nancy K. Schlossberg, EdD, author of Retire Smart, Retire Happy: Finding Your True Path in Life. "The loss of an identity tag can be extremely disconcerting for many people." Loss of the work-world routines. We get used to going to work and seeing people who are part of that world (even the annoying colleague). Not having a place to go or a workplace to check in with can also lead to a sense of loss of both a social network and of organization, and can leave one feeling somewhat "lost at sea," says Dr. Schlossberg. Relationship shifts at home. Retirement, like getting married or having children, can exacerbate any fissures in a relationship, notes Dr. Deitch. "When one or both partners are at work, there is a natural division of personal space. Suddenly being together 24 hours a day, seven days a week can be incredibly disruptive." Sense of mortality. Retirement can serve as a reminder that you're closer to the end of your life. Even if that end is realistically 20, 30, or more years away, just entering retirement can trigger feelings of "What will I lose next?" Shake-up of self-esteem. If the retirement was under strained circumstances — being eased out, pressured to retire, or even fired — the loss of a job can be felt much more acutely and can lead to feelings of inadequacy, diminished self-esteem, and depression. Once you've identified the roadblocks that are preventing you from making the most of your retirement, try these tips to create a new life for yourself that's as stimulating and joyful as you want it to be. First, give yourself some time. Understand that this will be a process. Your transition into retirement won't happen overnight, and your emotions may shift from one day to the next. Assess your resources. Consider the things you turned to during other periods of change in your life, says Schlossberg. To help you identify ways to cope with your transition into retirement, ask yourself three questions: Can I change what's challenging me? If not, can I change the way I see it? And finally, can I reduce my stress level through meditation, exercise, therapy, etc.? This will help you target areas that need work. Build your psychological portfolio. "We ready our financial portfolios but forget about our 'psychological portfolios,' which includes our identity, our relationships, and our need for a sense of purpose," says Schlossberg. Craft a new identity by imagining what you'd put on your new business card: World traveler? Gardener? Artist? Then build a new routine, whether it's a daily trip to the local coffee shop or a walk with a friend. Maintain friendships. Numerous studies have shown that friendship — even if it's just with one confidant — reduces stress, says Deitch. Make it a point to connect regularly with friends, and join groups or take classes in subjects you're interested in, which will lead to new friends. Men may especially find this helpful since they tend to form alliances based on shared interests and activities rather than relationships. Exercise. Not only will getting active increase mood-boosting, stress-relieving chemicals such as endorphins and serotonin, it'll also increase your overall health and help ward off illnesses. Make a mission statement. Write down a list of things you want to do and things you regret not doing and then identify ways you can achieve those goals. Find your path. As you consider your options, think about whether you want to spend your free time doing something similar to what you did in your job, or if you want to try something wholly different. Exploring something you've never done before can be a great way to stimulate your mind and make new friends. If nothing is working, seek help. No matter what you choose to do with your time in retirement, say experts, try to get involved and stay involved. Being inactive and feeling lethargic and depressed are signs that you may need to seek advice from a mental-health professional.Keeping a positive attitude about what tomorrow may bring, even if you feel down today, can also be a big help. Getting the flu can be a nasty experience, no matter what your age or general health, and each year flu shots are a major public health initiative. But, because of the risks to the elderly, senior flu prevention is especially important. According to the Centers for Disease Control (CDC), each year more than 200,000 people will be hospitalized because of the flu, and 36,000 of them will die. "Disproportionately it's the elderly," explains Debra Beauchaine, MN, ARNP, and geriatric services director at Virginia Mason Medical Center in Seattle. Seniors in their seventies and eighties are at higher risk from the flu than seniors in their sixties, because of declining immunity to illnesses as they age. Seasonal (or common) flu is one of the most highly contagious illnesses. It is spread by "respiratory drops"-coughing and sneezing. Someone may touch something with the flu virus on it-such as door knobs, telephones or shopping cart handles-then unwittingly touch their mouth or nose. And it's not enough to simply stay away from other people who feel sick. "People may be contagious one day before they develop any symptoms, and for up to five days after becoming sick," Beauchaine says. "That's part of the problem; people don't realize they have the virus before they actually feel sick." Flu symptoms include fever, chills, runny or stuffy nose, headache, sore throat, cough, extreme fatigue, and muscle aches. Nausea, vomiting and diarrhea are sometimes present, but rarely prominent. Flu season typically runs from October through the end of February, but some years it runs into March and April as well. It is estimated that 10 to 20 percent of the U.S. population contracts influenza each year. Once someone gets the flu, the only real "cure" is to rest and drink plenty of fluids, although a doctor may prescribe Tamiflu® or Relenza®, both anti-viral medications which can keep the influenza virus from spreading inside the body and shorten the duration of symptoms. Both must be taken within 48 hours of the onset of flu symptoms, and neither is a substitute for a flu vaccination. While otherwise healthy adults can be laid low by the flu for a full week, senior citizens are at risk for becoming much sicker. "They are more vulnerable, once they get the flu, to develop complications," Beauchaine says. "Because the flu is really a pretty severe illness, they may not have as much of what we call 'physiological reserve' as a younger adult. So, seniors will feel very sick from a case of the flu and that puts them at greater risk for complications." Dr. W. Paul McKinney, associate dean of the School of Public Health at the University of Louisville, explains that one of the more serious complications is primary viral pneumonia or a secondary bacterial pneumonia. Most hospitalizations and deaths from the flu are a consequence of pneumonia and other respiratory disorders. Also, if a senior has any chronic health conditions, such as congestive heart failure, chronic lung disease, even diabetes or renal failure, those could be exacerbated by the flu. And another common complication of the flu is dehydration, so drinking plenty of fluids is especially vital for the elderly. Staying away from work or crowded places while sick is important to prevent spreading the flu to others. But that's not an option for seniors living in nursing homes or assisted living facilities, making senior flu prevention that much harder at these communities. "When you congregate large numbers of people in close quarters, transmission is a lot easier," McKinney says. However, Beauchaine points out that nursing homes usually require all employees to be vaccinated, which is the single most effective way to guard against getting the flu. And, it's important to get a flu shot every year, because the virus changes slightly from year to year. Getting a flu shot one year and not the next, will not protect someone from that year's particular strain. "They should make every reasonable effort to get vaccinated early in flu season," McKinney says, but don't do it too early in the season, because occasionally the immunity will wear off before flu season ends, especially if the season lasts into March or April. According to the U.S. Department of Health and Human Services, seniors covered by Medicare Part B pay no coinsurance or deductible for their flu shot, as long as they receive the shot from a Medicare provider. What if a senior is otherwise healthy and doesn't feel they are "at risk?" "There is no reason a healthy senior should defer a vaccine," McKinney says. A University of Michigan study found that boosting elderly flu vaccinations could save as many as 6,500 lives over ten years. In fact, research from Johns Hopkins University shows that annual flu shots reduce the number of deaths among hospital patients by one half. While vaccination is the most important senior flu prevention, it's only 70 to 90 percent effective, so some people who receive the vaccination will still get the flu. So, for at-risk populations, it's especially important that everyone around them also gets vaccinated. That includes everyone involved in taking care of the elderly. And like nursing homes, some hospitals, such as Seattle's Virginia Mason, require all employees to be vaccinated. The CDC's target groups for vaccination keep expanding, recently adding children aged 2-5, and lowering the seniors' age range from age 65+ to 50+. The CDC estimates 218 million Americans fall into the at-risk groups that should be vaccinated. "That's over two-thirds of this country," McKinney says. "This year we'll have 100 million doses of the vaccine, so we won't even be able to vaccinate 50 percent." According to McKinney, the U.S. should not face a vaccine shortage this year. "Unless someone is in a very remote, isolated area, there shouldn't be a problem getting the vaccine," he says. Although some people believe certain foods or vitamins can ward off illness, Beauchaine says that while they may make you healthier in general, they aren't effective for senior flu prevention. During flu season, practicing good hygiene can help people avoid catching or spreading the flu. Wash hands frequently, especially after touching door knobs and stair rails in public places. Always cover nose and mouth when coughing or sneezing, and immediately wash hands afterward. And, of course, stay away from people who are sick. People taking care of the elderly especially need to follow this type of common sense senior flu prevention. Finally, don't confuse influenza with avian flu. While bird flu gets a lot of press these days, it is extremely rare, occurring when a human has direct contact with infected poultry or surfaces contaminated by secretions or excretions from infected birds. Vaccines to protect against bird flu are being developed, but are not yet available. As tough as it may be to enlist the help of a "stranger" when it comes to caring for your parents, sometimes it's for the best. For one thing, it will take the strain off of you, but your parent will also benefit from professional care in the comforts of home. Whether it's being attentive to special medical needs of assisting with personal care or homemaking, having a home health care professional will provide a variety of benefits to both the patient and the family. 1 - Home care promotes healing. "I know that our clients enjoy a much better quality of life which many families have said helped to extend the lives of their lived ones.," says Peter Ross, CEO and co-founder of Senior Helpers. "We focused on healing the mind, not just the body." Maxine Hochhauser, CEO of Visiting Nurse Regional Health Care System adds that in many circumstances the person rehabilitates better in the home. "They are in a familiar environment and are more comfortable. This is particularly true with individuals suffering from dementias." 2 - Home care is safe. "Many risks such as infection are eliminated or minimized when care is given at home," says Ross. Quality home care by professional caregivers can help prevent issues that may become very serious within the home. One example includes preventing falls in the home since seniors may be too weak or dizzy from medication since they fall when they're cleaning or bathing. 3 - Home care allows for maximum amount of freedom for the individual. Patients at home may be engaged with their typical daily activities as their health permits plus it allows patients to receive care in the least restrictive environment. "This is the most conducive to patient-centered care which allows individuals the most control over the care they'll receive and the manner in which they receive it," notes Hochhauser. "Plus, it allows individuals to remain in the community." 4 - Home care gives them some control. As baby boomers age the home care option gives them more control over the type of care they'll get to choose. Hochhauser explains, "They want more choices and want to be a more active participant in their own care. Home care allows them the most say in their care as they are in the least passive situation." 5 - Home care is personalized. According to Milca Pabon, RN, a home health care nurse with Adventist Home Health, "the best reason to choose home care is because the care that will be received in the home will be individualized to each patient according to their specific needs." Essentially home care is tailored to the needs of each patient as they receive one-on-one attention. 6 - It eases burdens on the family. Pabon explains, "With the length of stay in the hospital decreasing patients are going home earlier and many of them do not choose to go to a rehabilitation center to recover," explains Pabon. Rather, they want to go home to their own environment with their loved ones and have someone provide them with care they'll need to reach their maximum level of function. She continues, "Families are willing to have their loved ones with them, but may feel inadequate or unable to provide their loved ones with the help that they might need." 7 - Home care is comfortable. "Every study done has shown that people would prefer to stay in their home," says Constance Row, executive director of the American Academy of Home Care Physicians. There is familiarity and comfort of being in one's own environment surrounded by their loved ones. She notes, "It's a type of quality care that people would want for their senior relatives." Your new home in Dover, NH with care as you need it! Dover, NH now features a beautiful and brand new complex specifically designed to provide apartments for those 62+ with daily needs. This unique concept provides the option of in-home care provided by Abundant Blessings Homecare for those who need a helping hand. Mast Landing also offers dining services. Abundant Blessings Homecare is partnering with Mast Landing Senior Care Housing to provide service enriched housing. GEORGE F. FULLER, COL, MC, USA, White House Medical Clinic, Washington, D.C.
Am Fam Physician. 2000 Apr 1;61(7):2159-2168. See related patient information handout on the causes of falls and tips for prevention, written by the author of this article. Falls are the leading cause of injury-related visits to emergency departments in the United States and the primary etiology of accidental deaths in persons over the age of 65 years. The mortality rate for falls increases dramatically with age in both sexes and in all racial and ethnic groups, with falls accounting for 70 percent of accidental deaths in persons 75 years of age and older. 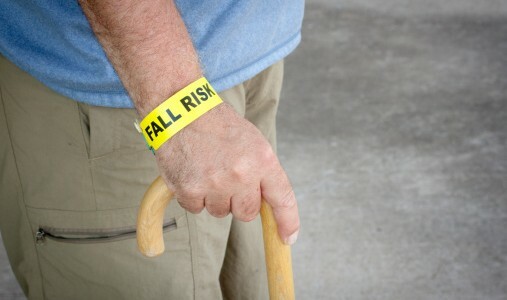 Falls can be markers of poor health and declining function, and they are often associated with significant morbidity. More than 90 percent of hip fractures occur as a result of falls, with most of these fractures occurring in persons over 70 years of age. One third of community-dwelling elderly persons and 60 percent of nursing home residents fall each year. Risk factors for falls in the elderly include increasing age, medication use, cognitive impairment and sensory deficits. Outpatient evaluation of a patient who has fallen includes a focused history with an emphasis on medications, a directed physical examination and simple tests of postural control and overall physical function. Treatment is directed at the underlying cause of the fall and can return the patient to baseline function. Elderly patients who have fallen should undergo a thorough evaluation. Determining and treating the underlying cause of a fall can return patients to baseline function and reduce the risk of recurrent falls. These measures can have a substantial impact on the morbidity and mortality of falls. The resultant gains in quality of life for patients and their caregivers are significant. One fourth of elderly persons who sustain a hip fracture die within six months of the injury. More than 50 percent of older patients who survive hip fractures are discharged to a nursing home, and nearly one half of these patients are still in a nursing home one year later.18 Hip fracture survivors experience a 10 to 15 percent decrease in life expectancy and a meaningful decline in overall quality of life. Our elderly loved ones need a little extra TLC during the hot summer months. Find out why dehydration increases with age and get valuable tips on keeping your favorite senior hydrated. Senior dehydration is a common health issue that can lead to bigger problems if proper hydration is not made a priority, such as urinary tract infections and low blood pressure. Proper hydration helps to keep the body and vitals regulated. The University of Chicago Medical Center found that 40% of heat-related fatalities in the U.S. were among people over 65. The ability to notice changes in body temperature typically decreases with age. As people get older, body water content decreases. Many medications the elderly take make them more susceptible to dehydration. The elderly often experience diminished thirst; which leads to a reduced fluid consumption. With aging, the kidneys have a reduced ability to concentrate urine and retain water during water deprivation. Specific conditions, such as reduced swallowing capacity, decreased mobility, comprehension and communication disorders, as well as, decreased mobility and/orincontinence can contribute to dehydration. Many seniors have underlying health conditions that make them less able to adapt to heat. What Health Issues Can Dehydration Create? There are some staggering statistics, compiled from The Department of Health, The Hydration for Health Initiative, The Adult & Geriatric Institute, European Review of Aging and Physical Activity, and the Department on Aging, about dehydration in seniors. Dehydration is a frequent cause of hospitalization of older adults and one of the ten most frequent diagnoses responsible for hospitalization in the U.S.
What Steps Can Be Taken To Prevent Dehydration? Offer fluids on a regular basis throughout the day. Encourage 8 oz. of fluid intake every time the senior takes medication. Keep water bottles and/or a water cooler available throughout the day wherever the senior is (for example, in bed, on the patio, throughout the house or at the senior living community). Provide favorite “mocktail” concoctions (see below for some great recipes) or your senior’s favorite beverages (make sure they’re not caffeinated or alcoholic). To make the sugar syrup, boil sugar and water together in a ratio of 1:3 sugar to water until it thickens to a runny syrup consistency. Store in a jar for all future cocktail making. Measure 1 cup of coconut water, either directly from a cut-open coconut or from a store-bought container (if you are lucky enough to live in an area that sells fresh coconut water in a bottle). Combine the strawberries and sugar syrup and blend with a blender to desired consistency. Start by cutting your cucumber in half. Peel one half and cut it lengthwise (you can cut it in half again first if need be). Scoop the seeds out and chop it into pieces. Put the cucumber pieces in a food processor and puree until smooth. Put puree in a fine mesh sieve over a container and push with a wooden spoon or spatula, extracting as much liquid as you can from the cucumber puree. Fill a separate bowl or container with 3 cups water. Squeeze 2 lemons into the water and mix in the sugar. Pour lemonade and cucumber juice into a pitcher or serving container. Slice remaining cucumber half (unpeeled) and remaining lemon and add to pitcher. Add basil, too. Refrigerate until chilled. Decisions regarding senior living options can be overwhelming for seniors and their families. There are stages in everyone’s lives when living situations must be considered. The earlier you and your loved ones discuss these choices, and how needs change over time, the less stress you will have. The following article can help you plan and make informed decisions so that these choices will be less overwhelming. Living choices depend upon the health and well-being of the individual. These choices are usually in one of three categories: Independent living, Assisted living, and Nursing Care. For healthy seniors enjoying retirement, they are living independently. Independent living does not mean that you cannot have the assistance of others. It just means you do not depend on it. Many seniors living in their own homes, or in a retirement community, choose to use home care. There are many reasons for this, from companionship to help with cooking, cleaning, and running errands. This assistance provides the extra time to enjoy retirement life. As you age, your health and well-being changes. Consider your choices. As age related health conditions develop loved ones may be concerned for your health and safety. Often seniors will be in denial that they need help. If there is a diagnosis of a disability or condition that limits their ability to care for themselves, assisted living should be considered. Conditions such as heart problems, Alzheimer’s disease, and a host of other age related disorders warrant this level of help. For those who want to remain in their own home, assisted living can be provided through a homecare agency. Homecare can provide help with daily living activities, from household chores to personal care assistance such as bathing, dressing, medication management, and mobility assistance. Many Independent living communities have an assisted living offering. Assisted living facilities may be a good choice if the senior cannot remain at home, yet does not need skilled nursing care. There are many choices available for your health, safety, and peace of mind. If needs become such that skilled nursing care is required, a nursing home may be the best option. Nursing homes provide intensive, long-term medical care to seniors with serious health conditions in a fully staffed and monitored environment. This may be the best option if family lives a distance away. Many seniors, even with high needs and disabilities can stay at home with a combination of homecare Aids, home healthcare nursing visits, and family support. Determining your best option is the goal. Different stages of life will cause you to confront different needs and options. We recommend discussing your needs and desires with family, those close to you, your doctor, and a Geriatric Care Manager. Whatever your hopes and desires are for your senior years, there are many choices. Aging in place, in the comfort and safety of home is now a feasible option for most. Whatever your stage of life, it is good to know you have choices. For here for a PDF of Senior Living Choices chart. The elderly often have to rely on others to meet their most basic needs. In some cases, the ones they rely on don't have their best interests in mind. Statistics tell us that about 9.5% of the elderly population is abused every year. One out of every 14 cases occurs domestically, usually within the victims homes, but abuse also occurs in nursing homes and other facilities. Elder abuse is not just physical. It can include neglect and financial exploitation as well as physical, psychological, and sexual abuse. Physical Abuse is defined as the use of physical force that may result in bodily injury, physical pain, or impairment. This can happen even with good intentions. For example, we have seen family members who force their elderly mother into the tub, because she has dementia and would not cooperate, causing minor injuries. When confronted, the family stated that they were just doing what the nursing home did. This is often how physical abuse occurs. Psychological Abuse is defined as the infliction of anguish, pain, or distress through verbal or nonverbal acts. What is often simple family conflict can easily get out of control and lead to an elderly family member being psychologically abused. Financial Abuse or exploitation is defined as the illegal or improper use of an elder’s funds, property, or assets. Family members, neighbors, friends, hired caregivers, or anyone who is particularly close to an elderly person can manipulate them for personal gain. Neglect is defined as the refusal or failure to fulfill any part of a person’s obligations to an elder, or the failure of an in-home service provider to provide necessary care. Being a caregiver is a hard and stressful job. Instead of seeking the help that is needed, many people simply ignore the problem, resulting in abuse. We all have the right to be free from abuse, neglect, and exploitation. The types of abuse discussed above could happen to any of our community’s seniors. If you suspect any form of elderly abuse, it is important for you to report it. Without intervention, abuse almost always escalates. Because victims are often reluctant to report abuse, a person’s safety may depend on you recognizing and reporting it. It is far better to report a suspicion and be wrong, than to remain quiet while abuse occurs. It is important to know that more then two-thirds of elder abuse perpetrators are family members of the victims or close family friends, typically serving in the role of a caregiver. Elder abuse can be stopped, but only if it is reported. If you or a loved one need homecare assistance, we recommend using a licensed agency rather than hiring privately. Homecare agencies must conduct criminal background checks, and BEAS (Bureau of Elderly and Adult Services) registry checks. The BEAS registry is a database containing information on founded reports of abuse, neglect or exploitation of incapacitated adults by a paid or volunteer caregiver, guardian or agent. There are also individuals with a clear criminal background check who are in the BEAS registry. The NH BEAS registry can be reached at (603) 271-3269. Also, keep in mind, only criminals who get reported and charged have criminal records. Some homecare agencies and nursing facilities conduct pre-hire personality tests. These tests help determine if an applicant has a tendency toward certain types of crime or questionable behavior. We recommend using an agency that uses CQA (Caregiver Quality Assurance) www.selectacaregiver.com. To obtain a license, a homecare agency must meet certain requirements for the state. In addition to the above, we recommend asking your potential agency questions pertaining to things the state does not require of an agency, yet are important when considering care for a loved one. · How long has the agency been in business? · Are all caregivers employees or are they subcontracted? · What are their hiring standards? · What is the company dress code? · How much experience do the employees have? · What is the training and continuing education program for the employees? · Does the agency provide drug abuse testing for employees? · What is the range of pay provided to employees? · Are your caregivers insured and bonded? · Is there enough staff if at any time my loved one needs more hours of care (ie: 24 hour a day), or if a caregiver should call in sick do you have the staff for coverage? · What are your hours of operation, how are phone calls handled during odd hours? · What types of pre-hire screening do you conduct on your employees. Click Here for a PDF of Questions to Ask Before Hiring a Homecare Agency. As we age it is common to have an increased need for daily medications. It is typical for seniors over 65 to be taking 5 to 6 different medications per day. Almost 20% of elders (65 years or older) take 10 or more medications. (1) For seniors, the management of medications can be a challenge. Remembering to take medications, which ones, and when is often too overwhelming for them to handle on their own. In addition to seniors, it is reported that nearly 75% of all Americans do not take their medications as prescribed. Improper medication management at home causes approximately 125,000 deaths per year, and 10% of all hospital admissions are medication related. For those over 65 the number escalates, 30% of hospital admissions are directly related to non-adherence of prescribed medication. Many seniors have family members who help with their medication regimen. This often includes filling medication reminder devices or pill dispensers. These dispensers can range from highly sophisticated electronic devises to simple Sunday through Saturday plastic holders. Filling them is one thing, knowing when to take the medications, and remembering to take them is another. What can be done to help with this problem? At Abundant Blessings Homecare, Inc. we have seen the problems with medication management in many different situations. We have adopted a plan of action we would like to share and recommend. This plan is listed below. 1. Best practice is accountability. To have a caregiver with you to prompt and remind you to take your medications at the appropriate time and to document is ideal. This person can be a family member or a private duty homecare aid. The key is to have someone there anytime medications are to be taken. sealed by the pharmacy and all medications which are to be taken at any given time are together in one pouch. Bubble packs help eliminate confusion as to when and what pills to take. No one needs to fill a weekly dispenser; the bubble pack acts as a prefilled dispenser. A caregiver may still be needed to remind and prompt. Studies indicate that One 14-month study indicated that patients' medication compliance had risen from 61% to 96%. 4. If none of these suggestions are taken, we would recommend at minimum utilizing basic weekly Sunday through Saturday medication dispensers. These can be obtained at any pharmacy. They are very simple to use, yet help tremendously with medication compliance. (1) Boyd CM, Darer J, Boult C, Fried LP, Boult L, Wu AW. Clinical practice guidelines and quality of care for older patients with multiple comorbid diseases. JAMA. 2005;294:716-724. (2) Feldstein AC, Smith DH, Perrin N, et al. Improved therapeutic monitoring with several interventions. Arch Intern Med. 2006;166:1848-1854.